Nearly 1000 years ago, in 1076 our forefathers established Quoc Tu Giam, where academic talents of the country were trained. This shows that a long time ago, our Fathers had acknowledged that 'Talents are the key to a country’s development' and they have drawn attention to detecting and fostering talents, generation after generation. Twenty five years ago, in 1985, the Hanoi People's Committee and the Department of Education and Training (Hanoi) had an important decision which was unprecedented in the history of education in Vietnam. The decision was to add to the magnet school system a new high school for gifted students in order to provide those students with special skills and training that are of equivalence to their capacity. Hanoi - Amsterdam High school for the Gifted was founded, carrying its mission of seeding, developing the students’ talents and giving wings to the aspirations of the capital’s youth. After only a short period of 15 years, in 2000, this small school located on the banks of the beautiful Giang Vo Lake achieved ​​a miracle: it was awarded with the title 'Heroic unit in renovation period' by the State. In 2004, along with the honour of receiving the First Class Labor Medal, the school has been recognised as a national standard school. That was a noble prize for the school, which motivated it to achieve more progress in entering the era of 1000 - year - old Hanoi. Founded during the country’s period of renovation and international integration, in the last 25 years, Hanoi - Amsterdam High school has been in the right direction to become a leading educational institution in patterns of advanced education and in innovation. Creating a thriving development path, it is on par with other prestigious schools in the region as well as around the world. Equip students with firm knowledge of science; meet with all requirements and criteria for academic evaluation of the Ministry of Education and Training. Provide solid knowledge and help students develop scientific methods of studying. Students will often easily integrate into the extensive training courses of renowned universities and colleges in Vietnam and in the world. Train excellent students in order to achieve high prizes and awards in exams for gifted students nationwide and worldwide. The students will become creative human resources who are able to adapt to any changes in the world and contribute enormously to the development of a civilised and prosperous Vietnam. Create an open environment, encourage creativity, reasoning ability, thinking capacity and autonomy of the students. Train students to be comprehensively developed future citizens who are physically healthy, strongly intellectual and morally humane. Students will also know how to take responsibility for themselves, their families and society to meet all requirements of the period of international integration of the country. In August, 2010, after years of waiting and yearning, the school finally received a beautiful campus, situated on an area of about 5 ha in the heart of My Dinh new urban centre. Modern facilities, advanced equipment with 45 classrooms, 9 rooms for national teams, 15 specialised classrooms for every subject, laboratories, libraries, language rooms, computer rooms, conference halls, stadium, football field, tennis courts, basketball courts, swimming pool… can meet the learning and living requirements of 1.800 students. In addition, the school also arranged working, searching offices for every specialised purpose; a testing office with the function of giving and marking the school’s specialised examinations. An area of about 1000 m2 is dedicated to biology, geography… as an experiment garden. v Respect: respect the principles and the road chosen, knowing how to harmonize these principles with social relationships; be ready to accept friends with different opinions. v Integrity: creatively implement the policies of the Communist Party and the government; be honest with ourselves, avoid 'achievement disease'; be honest with others to build good relationships on the basis of trust. v Discipline: respect scientific working principles, accuracy and efficiency; build self-discipline and a high level of responsibility in teaching and studying tasks. v Listening and understanding: listen and analyse constructive opinions, contributions from students, parents for the purpose of self-improvement. v Cooperation: Hanoi - Amsterdam’s teaching staff is an united community with good working methods and cooperation so as to achieve common goals. 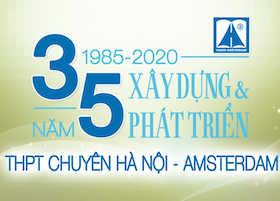 In the future, Hanoi - Amsterdam specialised high school will focus more on innovating manners and principles in organising educational activities, building teaching methods according to the rules of formation along with students’ cognitive and personality development, helping students define a solid traditional value system so as not to lose personal identity in the process of global integration. Moreover, the school strives to become one of friendship and acculturation: concentrating more on expanding the scale and quality of international training, creating exchange and twinning programs with friends around the globe; building training programs that link, exchange students and teachers with countries all over the world in order to increase mutual learning opportunities, develop teaching capacity of the faculty and learning capacity of students. On a new stage of development, Hanoi - Amsterdam specialised high school, with a noble mission, a thorough vision, will always keep its own value to become a school of the past, present and future recognition; as an American professor had stated after visiting the school in October 2003: “All over the world, the number of universities with worldwide recognition can only be counted on fingertips. Hanoi-Amsterdam high school for the gifted is a special case, a normal high school but is known to the whole world."